On 14 October people from all over the world will be taking action to protect our climate from fossil fuels. From groups fighting giant oil companies in Africa, to communities already feeling the impact of rising sea levels, the whole of Friends of the Earth’s global community will unite for a day of action. Our message to the world: keep fossil fuels in the ground. It’s our best hope of stopping the most devastating consequences of climate change. Here in Sheffield we have organised a fun family friendly rally outside the City Hall with the theme of keeping fossil fuels in the ground, skipping fracking and moving to clean renewables. 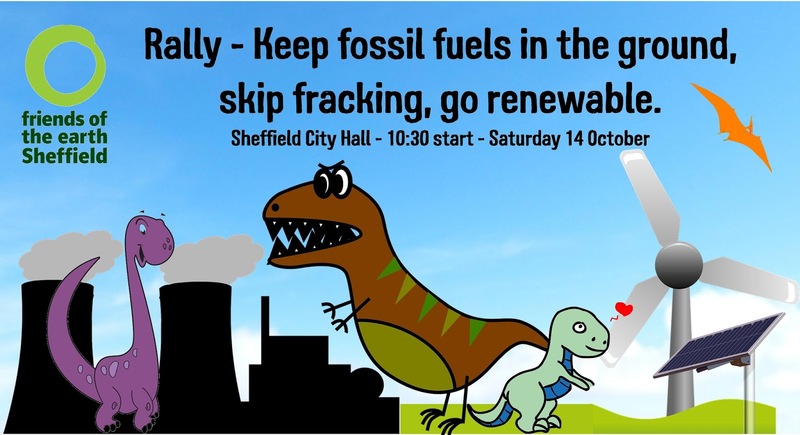 Because oil, coal and gas are seen as dinosaur fuels we would like as many dinosaur props as possible - inflatable dinosaurs, children’s t-shirts, face masks and placards etc. After the rally there will be a mass deflation of the inflatable dinosaurs to signify the end of fossil fuels. 10.30 - People start to assemble at Barkers Pool – City Hall. We are planning for family/children friendly activities - colouring, models if possible. More details will be added as they are confirmed. See https://www.facebook.com/events/420994184961818 for the Facebook event. Friends of the Earth will be using the hashtags of #ProtectOurFutures and #NotHereNotAnywhere for the day of action on Saturday 14 October. Please take lots of pictures and post them on social media.